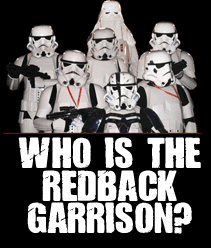 Redback Garrison » Blog Archive » Stormtroopers Do Dreamworld! February 17, 2010Posted by Moxxxie Comments Off on Stormtroopers Do Dreamworld! More than 30 characters from ‘The Galactic Empire’, made famous through the Star Wars film trilogies, will take a break from ‘controlling the galaxy’ to strike Dreamworld on February 27 in a calculated war to raise funds for the families of seriously ill children around Australia. The member’s of the 501st Legion’s Redback Garrison, known as Vader’s elite troops, will be hanging up their lightsabers and holstering their blasters as they go on a mission to ‘do good’ with the hope to raising $5000 for the Starlight Foundation. Stormtroopers, Sandtroopers, Biker Scouts, Tusken Raiders, Clonetroopers and even the Sith Lord himself, Darth Vader, will be taking on the high profile operation, posing for photos with in-park guests and fans with one dollar from every purchased photograph going directly to charity. The mission will also include face painting and the chance for guests to make donations as the troop rattle the Starlight tins around the park. “Our legion brings the fictional to life and we find that hundreds of fans enjoy coming out to see the troopers altogether. It’s a great way to create interest and use our hobby to give back to the community,” he continued. Fans can take to the skies with the characters as they flip, spin and soar on some of Dreamworld’s fiercest thrill rides. Children under 12 years are encouraged to dress in their best Star Wars costume to receive a discount on entry and a space in the legion’s march through Dreamworld’s Main Street at 11.30am. Despite being notorious for their evil ways, the 501st Legion, the only Star Wars costuming group endorsed by George Lucas, have ‘harnessed the force’ on many occasions, assembling for the Starlight Foundation to raise valuable funds and perhaps clear their conscience from all the intergalactic battles fought previously. “Starlight is the perfect charity for us to support. We aim to bring people’s imaginations to life and Starlight work to bring the dreams of seriously ill kid’s to life. Plus the 501st legion members are all big kids,” said Mr Lochowicz. For more information on the upcoming Stormtrooper charity event at Dreamworld please phone 5588 1111. This entry was posted on Wednesday, February 17th, 2010 at 10:05 pm	and is filed under Garrison News, Media Reports, Mission Reports. You can follow any responses to this entry through the RSS 2.0 feed. Both comments and pings are currently closed.